Mack 10 spent his youth learning the street life of Los Angeles, no doubt spending most of his time finding lost pets for tearful orphans and helping old ladies with their groceries. In the early 1990s he hooked up with rapper Ice Cube, with whose help he was signed to the Priority label and recorded his 1995 self-titled debut. The album's brand of traditional West Coast gangsta smack-talking was enthusiastically received, spawning the popular single Foe Life, as well as featuring the first appearance of Mack & Cube's project Westside Connection on the track Westside Slaughterhouse. A full-length Westside Connection release followed in 1986, climbing to the number two chart position and consolidating Mack's notoriety. 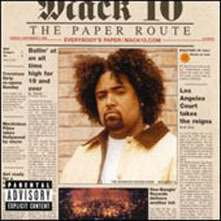 A second Mack 10 release appeared in 1997, Based on a True Story -- again featuring contributions from Ice Cube, but primarily executed by Mack himself. This album proved to be the most popular of his career, which began a steady decline with subsequent efforts. The next album, Recipe (1998), was buried under an avalanche of guest appearances; by 2000's The Paper Route public attention had drifted and his relationship with Priority was over. By this time Mack 10 had formed his own record label (Hoo Bangin Records), his own production company (Mack One-O), and had begun to establish a career as an actor through roles in the TV series The Jamie Foxx Show (1996) and Dark Angel (2000), and the film Thicker Than Water (1999). In 2001 a new contract was arranged with the Cash Money label, resulting in a fifth solo release, Bang Or Ball. Response to the album was mediocre, but some ground was regained the following year with the sporting event-style anthem L.A. for Ya from Mack 10 Presents Da Hood. Subsequent work includes 2003's Ghetto, Gutter & Gangsta, and roles in low-budget flicks Random Acts of Violence (2002) and Cutthroat Alley (2003).